Summer is a popular time of the year to undertake lawnscaping, home renovations and improvements, and there has been a growing trend of homeowners completing these tasks themselves thanks to the DIY movement. Unfortunately, while DIY can be cheaper and more satisfying than hiring a professional, it also comes with safety risks that need to be considered whenever you are planning your project. One in five DIYers are admitted to the hospital every year as a result of a DIY-related accident. If you’re planning a home project this summer, follow these DIY tips for safety. In order to avoid DIY accidents, it is crucial to have a plan in place. Know what you are going to do, how you are going to do it and what safety risks are involved. If you are attempting a project that has a great safety risk or requires technical knowledge you do not possess, it might be best to hire a professional. This is especially true for projects that involve electrical wires or gas lines. In addition, anyone planning projects that require digging, such as pool or deck installations, is required by state law to notify underground utility companies of intent to do so. The best way to know if there are underground utility lines on your property is to check with the Pennsylvania Public Utility Commission before beginning excavation, so Call Before You Dig. Understand the tools you will be using to complete your DIY project. Be sure you know how to safely handle these tools and if any other safety gear is required, like safety glasses or protective gloves. If there is a tool you feel uncomfortable using, DON’T USE IT. Your fear of the device could lead to an accident. An often overlooked, but important DIY tip for safety is to maintain a clean workspace. A clean area can mean the difference between a safe and an unsafe working environment. A clean work area helps to prevent falls, fires and chemical spills. If you are performing yard work, clear the lawn from rocks and debris that can become projectiles when introduced to a lawn mower or power trimmer. If you are working indoors and using any chemicals, be sure your workspace has proper ventilation. Ladders can be just as dangerous as power tools and chemicals if the proper safety precautions are not taken. According to ThisOldHouse.com, 247,000 people were admitted to the emergency room last year due to ladder-related injuries. Choose the right ladder for the job. If your project involves electrical wires, use a ladder made from a non-conductive material like fiberglass. Be sure the ladder has the correct weight limit to support yourself and any tools you may carry with you. Never use the top two rungs of a ladder and try to keep three points of contact with the ladder at all times. Use the 4-to-1 Rule when positioning a ladder against a wall or tree: For every 4 feet of ladder you have to climb, move the base 1 foot away from the wall or tree. 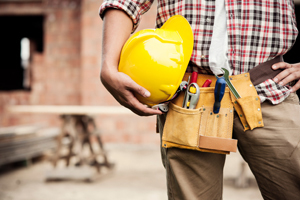 If you are injured from a DIY or construction-related accident, please call our team at KBG Injury Law. We are available 24/7 for Results You Deserve.